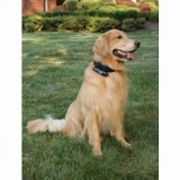 A GPS dog collar is something you might want to take a look at if you have a dog that's a great escape artist or one very quick to take advantage of an open door or unlocked gate. Once a dog gets out he can disappear as quick as a wink and may not be able to find his way back even if he wanted to! GPS means Global Positioning System and oh, I know they are expensive. But losing your dog can be even more expensive - emotionally!! The thing about dogs, even the best trained ones, is that they have these basic instincts that on occasion are impossible to control. Heck, when Rover jumps the fence in hot pursuit of something that got his attention, he simply doesn't want to control himself. He's just enjoying the call of the wild. On the other hand, your response in finding your dog missing, is an entirely different story. There's no joy - only a sense of panic as you worry about him getting completely lost or even run over! The main thing on your mind is finding him fast and getting him back home. That is where a dog tracking collar comes in handy. The GPS dog collar is designed for this purpose - yes, I know, you're still mumbling about the price. But, the great thing is, the collar will give you peace of mind and allow you to remain calm when your dog is AWOL - as in "missing" - because now you have the means to track him down. The GPS unit will give you the exact coordinates of your dog's location so you'll know in which direction to go. You simply pick up this information via an LCD receiver, or a cellphone. Another feature of GPS dog collars is the ability to program it with the perimeters of your property and set up an audible alert system. If your dog crosses those boundaries while the alarm is activated, it will go off, alerting you at once that your pet has left the property. This would be very helpful if someone should accidentally leave a gate open allowing Rover to wander off. 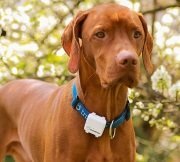 Yet another use for GPS collars, is for owners who want to keep track of their dogs while hiking with them off leash. There are quite a few GPS dog tracking collars available depending on how high tech you want to go and what options you'd like to have. Some track within a given radius and some track no matter where your dog may roam. The various units are pictured in the sidebar on the right. Just click on anyone of them to get more details. And, just in case you're wondering, the collar is completely safe and harmless to your pet. If you have to leave your dog alone for extended periods of time, one of these collars could ease your mind while you are away and may be a life saver for the family pet. for the best in Dog Obedience Training get the Secrets to Dog Training!